With the aging of the baby boom generation, predictions are that coping with Alzheimer's disease will be the country's highest cost medical challenge. According to a recent study published by the Journal of the American Academy of Neurology , the number of people with the disease is expected to triple in the next 40 years, totaling 13.7 million. Many leading companies are engaged in research and development activities aimed at achieving an eventual cure. Federal R&D Tax Credits are available to support credit eligible Alzheimer's innovation activities. The Alzheimer's disease is a progressive, degenerative disorder that affects the brain's nerve cells, or neurons, causing loss of memory, thinking and language skills, and behavioral changes. Alzheimer's is the most common form of dementia among people above 65 years of age. It is the only condition among the six top killers in the U.S. for which there is no prevention, cure, or treatment. There is no consensus as to what causes Alzheimer's disease. Age and genetics are risk factors, but most scientists understand that the condition is a complex result of a combination of determinants. Researchers believe, however, that understanding the hallmarks of the disease can open the way to future advancements. This approach is not limited to Alzheimer's, pharmaceutical R&D activities have increasingly refocused on understanding human-disease biology, in other words, how diseases work. The French Sanofi SA, for instance, has just hired 20 new R&D leaders to work in this field. According to Dr. Zerhouni , head of Sanofi's R&D, the industry is "extremely good at toolmaking but not very good at understanding the biology". Even though uncertainties remain, research has shown that Alzheimer's disease is characterized by a build-up of proteins in the brain tissue, which manifest in two ways 1) plaques, clusters of the protein beta-amyloid that accumulate between nerve cells, and 2) tangles, aggregates of the protein tau that accumulate inside the nerve cells. These hallmarks have somewhat guided the pursuit of a cure. On the one hand, researchers are investigating medications targeting virtually every point in amyloid processing (that generates beta-amyloid). They include attempts to block the two enzymes responsible for clipping the beta-amyloid from its parent compound amyloid precursor protein, namely beta-secretase and gamma-secretase. Some experimentations aim at preventing the beta-amyloid fragments from clumping into plaques, while others use antibodies against beta-amyloid to clear it from the brain. On the other hand, researchers have investigated methods to avoid the collapse of tau molecules and their twisting into tangles. Currently, there are five FDA-approved medications to treat the symptoms of Alzheimer's. On average, they are effective for six to twelve months in about 50% of individuals taking them . Since these drugs can only temporarily (and partially) slow the intensification of symptoms, there is still a long way to go in the discovery of a cure. Many leading pharmaceutical companies are engaged in the pursuit of prevention and treatment methods for Alzheimer's disease. 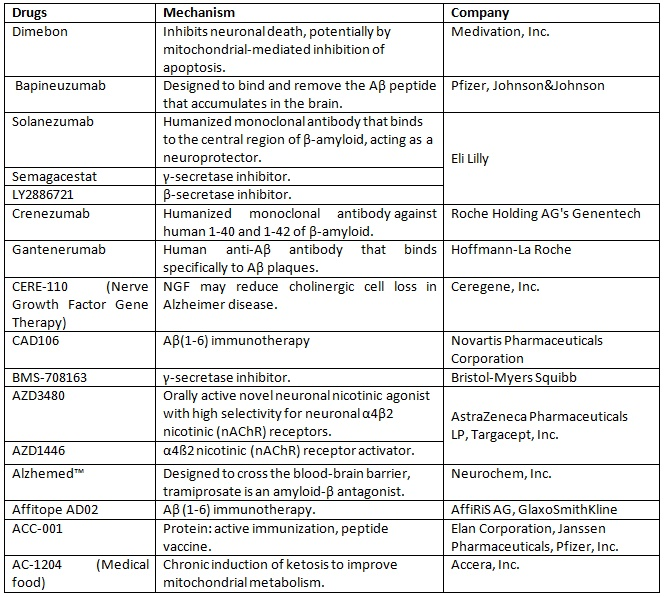 In recent years, various drugs have been tested; the following table presents examples of medications, underlying mechanisms and companies responsible for their development. Alzheimer's innovation, however, is not limited to drugs. Innovation and development of new technologies for treating Alzheimer's patients is also occurring. In the U.K., a clinic recently inaugurated its own "Memory Lane", a recreation of a 1950s street, with a traditional local pub, quaint cafe, and greengrocers. The street displays original pieces of advertising and authentic phone and post boxes. This familiar design is expected to increase comfort, calm, and foster socialization among elderly Alzheimer's patients . The key will be to develop data measuring tools to evaluate the effectiveness of this designed environment. Similarly, in Rome, Georgia, Renaissance Marquis's assisted living facility, Harbor, presents 1950s decor as well as old pictures and drawings from the city's landmarks. All features of the facility aim at creating an optimal environment for patients, from flooring types, textures and furnishings, to state-of-the art memory stimulation systems, such as SimpleC . The expected growth in Alzheimer's incidence is one of the greatest public health challenges of our times. The absence of effective treatment and prevention methods accounts for the urgency of intensive research and innovation in this field. Federal R&D Tax Credits are available to support Alzheimer's innovation activities.